My Blue Daisy...: Organic Whole Wheat Crackers - Yum! Organic Whole Wheat Crackers - Yum! Did you know you can actually make crackers at home? Well, of course, we all knew this, but have you ever actually considered it? 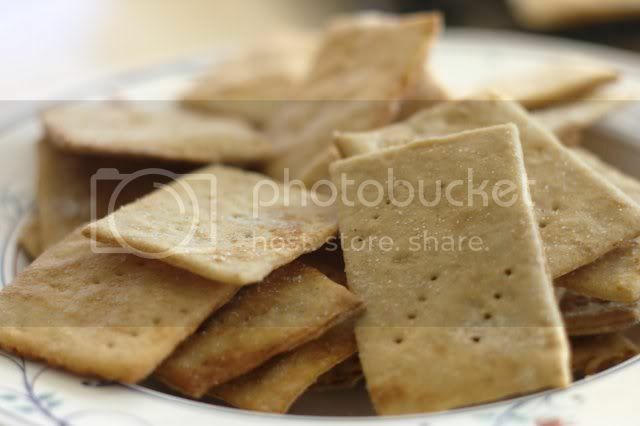 I always thought of crackers as something you buy - generally Wheat Thins. And by the way, wheat thins are no longer made with high fructose corn syrup. Let's give those folks a round of applause! Not too much applause until we find out how much GMO is in those crackers, mmmK? They are still made with "enriched" flours, therefore Aislinn can't have them. So we made them at home and they turned out yummy. I can't wait to make them again. I want to try adding garlic and rosemary to one batch and cinnamon and sugar to another. For the first attempt, though, we just made a lightly salted wheat cracker. Add the flour, Earth Balance, water and vinegar to a large mixing bowl. 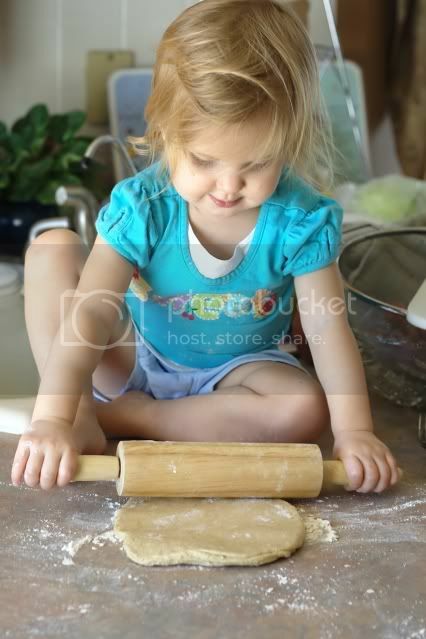 Mix with a fork until it becomes stiff then knead in the remainder of the flour until if forms a nice ball. It shouldn't be too sticky or too dry, but if it is just add a bit more flour or water to adjust. Cover with a clean, damp dish towel and let it sit on the counter overnight. The next day sprinkle the ball of dough with the salt and baking soda. 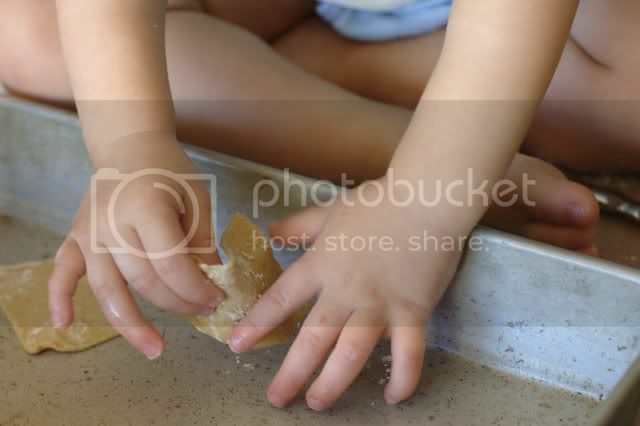 Knead the dough until the salt and baking soda is incorporated throughout. 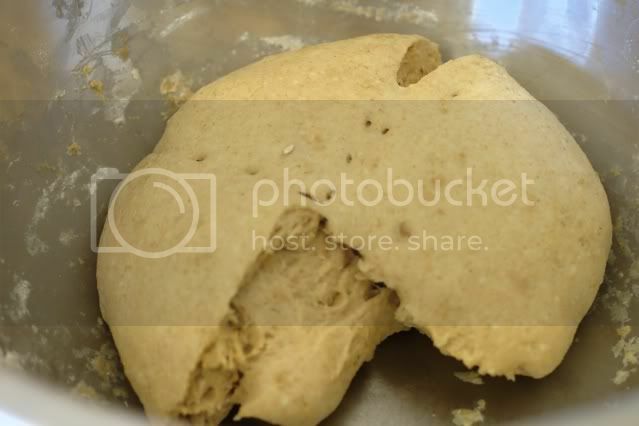 Roll out 1/4 of the dough onto a lightly floured counter. 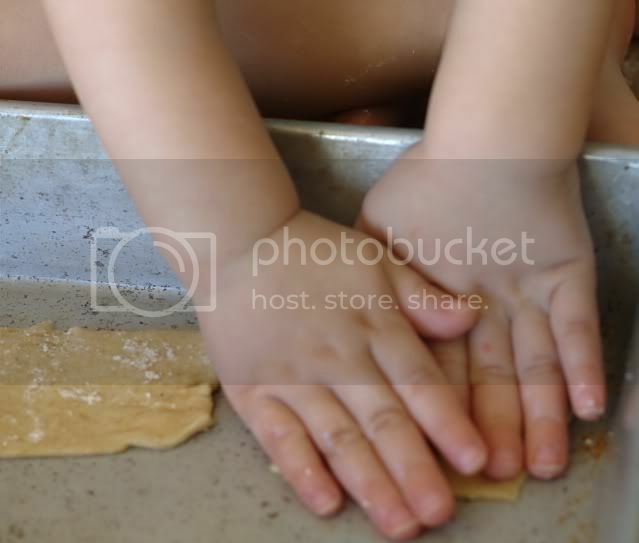 Roll the dough out evenly as thin as you can get it. 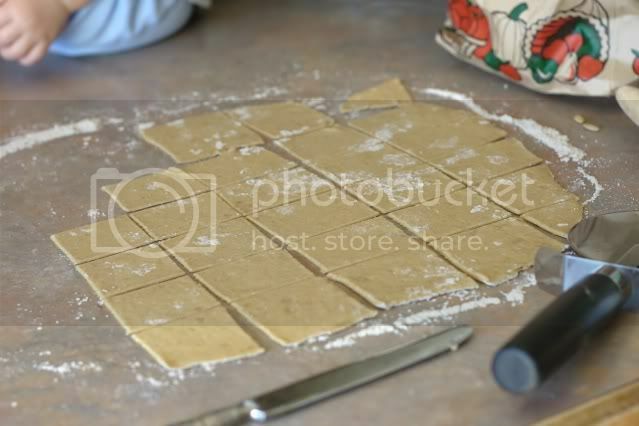 Use a pizza cutter or knife to cut the dough into cracker sized peices. 2 x 2.5 inches works for me, but you could make them smaller if you like. Transfer the cut pieces to a greased cookie sheet, prick with a fork, then lightly salt. Bake at 425 degrees (preheat that oven!) for 10 minutes. Don't stray too far from the oven as you don't want to over bake these. This recipe makes quite a few crackers, probably equal to about 2 boxes of wheat thins. Oh - and next time I plan to add about 2 teaspoons of sugar when I'm kneading in the salt and baking soda. Cost analysis: Wheat Thins cost about $3.29 a box at the local grocery store. I used about 4 cups of organic whole wheat pastry flour including what I used to flour the counter; that's about one pound ($0.99 / lb.). And 1/4 cup of Earth Balance is about 1/8th of a tub ($4.69 / tub). Salt, baking soda, and vinegar - let's just say 10 cents each for the sake of calculations. I doubt the small amount used cost that much. I'm considering the cost of water and oven use negligible, because I really have no idea how to calculate that. $0.99 + $0.59 + $0.10 + $0.10 + $0.10 = $1.88 compared to $6.58 worth of Wheat Thins. Not bad!! 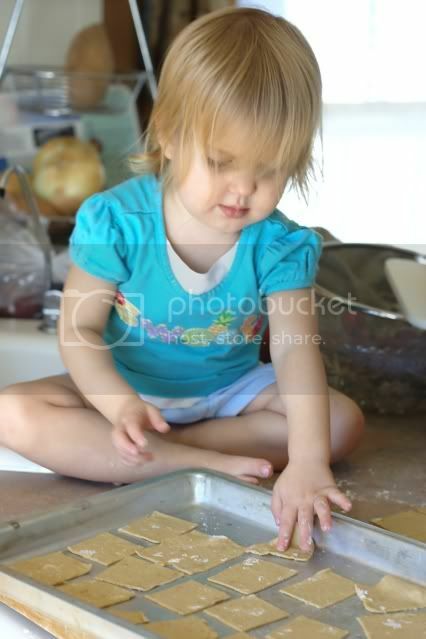 And when you are all done baking, don't forget to dust the flour off your chubby feet.